We begin with a layer of wax maple crumbs, we then add a layer of whipped wax in our ever popular Pumpkin Pecan Waffles scent. We continue with another layer of maple crumbs and then we topped it off with more whipped wax topping in the same yummy scent. 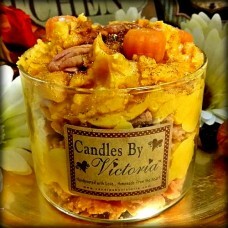 Finally we added wax pumpkin and pecan embeds then sprinkled the entire thing with glitter just because we can!